Cor VAN DEN HEUVEL. Poetry of James Write in Mosaic VII/3. 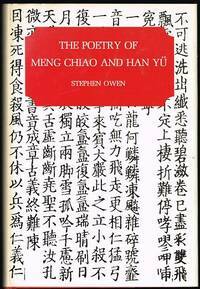 We can help you find the asian poetry books you are looking for. As the world's largest independent marketplace for new, used and rare books, you always get the best in service and value when you buy from Biblio.com, and all of your purchases are backed by our return guarantee. NY: Columbia University Press. VG. 1965. 1st Printing. Paperback. First printing. 5 1/4" x 8", 139 page trade paperback is in Very Good condition. Tanning to the book's spine and to the edges of the wrapper s. Rubbing to the front wrapper. Mild toning to the page margins. .
Haiku winners in Japanese (mostly) and English sponsored by the Kumamoto city with an introduction by the mayor. 140 pages including several in color with illustrated haiku. Book is in excellent shape with SLIGHT shelfwear. NY: The John Day Company, Inc.. VG. 1943. 1st Printing. Hardcover. No date, circa 1943. Hardcover bound in orangish cloth covered boards with red lettering on the spine and red Chinese lettering on the front cover. Very Good condition. Small bump at the head of the spine. Smal l rubs to the corners. Darkening to the spine. Tanning to the endpaper s and age toning to the pages. No dust jacket. .
[New York]: Pharos, 1947. First Edition. Wraps. Owner's initials on verso of cover; mild sunning to edges. Near Fine. Heavy rose wraps. Only 929 copies printed of this translation by Pound. NY: The John Day Company, Inc.. VG. 1943. 1st Printing. Hardcover. No date, circa 1943. Hardcover bound in orangish cloth covered boards with red lettering on the spine and red Chinese lettering on the front cover. Very Good condition. Small bump at the base of the spine. Smal l rubs to the corners. Some tanning to the enpapers and age toning to the pages. No dust jacket. .
NY: Twayne Publishers. Fine. 1973. 1st Printing. Hardcover. First printing of this edition, bound in maroon cloth with gold letter ing. 8vo size, 147 pp. A Fine copy in a slightly dusty but otherwise a bout fine dj. . TINY stain on bottom of cover, otherwise like new, the major journal of haiku in English. Poems and essays. HSA Journal with Haiku, Senryu and reviews, Over 100 pages, gently read. Warren, CT: Floating World Editions. NF. 2010. 1st Printing. Paperback. Stated first Floating World edition. 6" x 9", 153 page trade paperback is in near fine condition. Some dust spotting to the edges of the pag e block. 1" diagonal crease to the rear wrapper's lower left corner. .
Fredonia, NY: White Pine Press. NF. 1986. 1st Printing. Paperback. First printing of this edition. 6" x 9" trade paperback is in near fin e condition. Some dust spotting to the edges of the page block. Thumb nail crease to the front wrapper's lower edge. .
Cambrdige: Cambridge University Press. NF. 1976. 1st Edition. Hardcover. First edition bound in green cloth. A near fine copy in a near fine du st jacket. Dust spotting to the edges of the book's upper page block. Mild rubs to the jacket's spine tips and corners. Dust soiling to its rear panel. Part of the "Cambridge Studies in Chinese History, Literat ure and Institutions" series. .
Postscripts series volume 9 red moon press 2008 20 pages haiku by a master 4" x 5 1/2"
haiku, senryu, haiga some with color illustrations. In great shape.